How would you like to duplicate this stunning garden planter? We can show you how with a few simple tricks we discovered. Just follow the steps and you will see how easy this is to do. 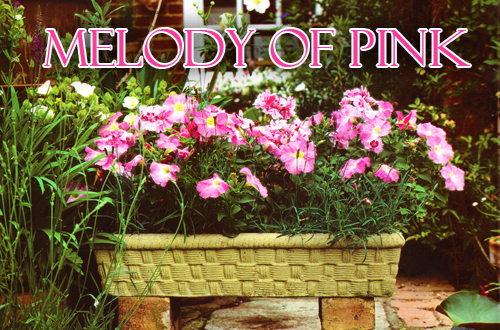 In a basket weave rectangle garden planter, sugar pink petunias are planted with ivy leaved pelargoniums and shaggy flowered pink dianthus with a deep red eye. None of these plants require depth for its roots and provided they are fed and watered regularly, this will be very happy. Of course any rectangle garden planter will work but we love the look of the basket weave. First fill the base of the window box shaped planter with a layer of washed gravel or a thin layer of pot filler. Then add the compost or potting soil mixing in 2 teaspoons of plant food granules. Now you can start the planting process. 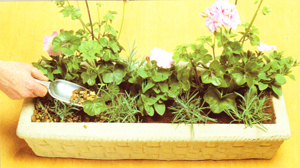 Plant the tow pelargoniums 4 inches from either end of the window box. Next is the petunia's, evenly spaced along the back edge of the rectangle. Lastly plant four dinathus along the front edge, and the other tow on either side of the central petuna. That's it! We recommend you spread a thin layer of gravel around the plants. Besides being decorative it also helps to retain the moisture and keep the soil from being wash away. Make sure you place the planter in a sunny place so it get a lot of natural sunlight. Once summer is over, the petunias and pelargoniums will need to be removed. The dianthus will overwinter quite happily. Just cut off any flower stems and add a fresh layer of gravel. Be sure and plant in Late Spring or early summer. Read more.....Grow daffodils in Arizona Pottery Pots. Read more.....Great gardens for potted plants.